While searching through shortgrass prairie atop the Pine Ridge in northwestern Nebraska in hopes of finding Cicindela nebraskana (prairie long-lipped tiger beetle), this harvestman caught my eye. 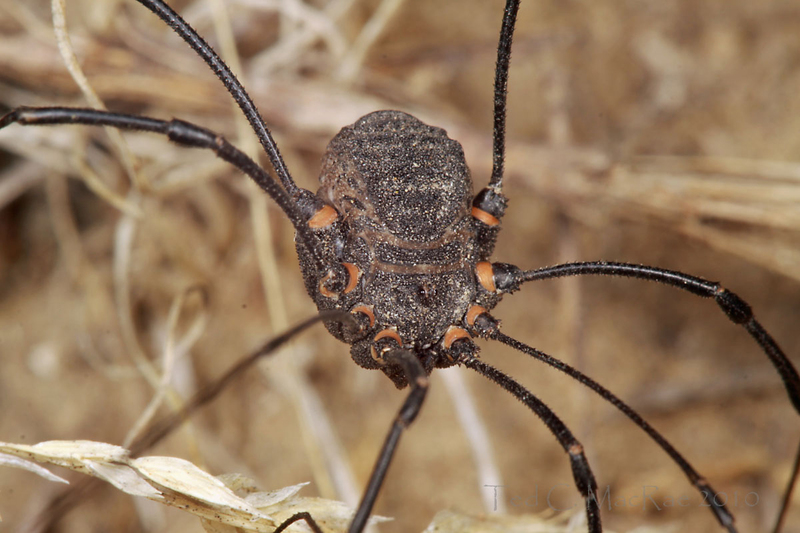 Harvestmen are, of course, arachnids related to spiders, but they lack fangs and poison or silk glands and are placed the separate order Opiliones (Phalangida when I was in school). Admittedly, I haven’t paid much attention to harvestmen before now, but this one seemed different from any I’d seen before – nearly black with relatively short legs and distinctive orange intersegmental articular membranes at the base of the legs. Harvestmen are known to employ chemical defenses through special repugnatorial glands that produce phenols, quinones, ketones, and/or alcohols, and this individual seemed to display a clear example of aposematic coloration to warn any potential predators of its distastefulness. Cokendolpher describes males as ‘body ranging from solid black…’ with bases of femora ‘yellow-brown’. The species is also known from western Nebraska. Cool. I was pleased to learn that these photographs represented a new species for BugGuide and no longer felt bad about not being able to find a good match. Further, my leanings toward the family Sclerosomatidae had been confirmed. According the Cokendolpher (1981), T. favosus ranges in a narrow band from North Dakota south to north-central Texas and is active only during fall. I had intended to try to get an even closer photograph, but after taking the second photograph above I accidentally disturbed the critter and then watched in amazement as it began bouncing up and down vigorously. This apparently is a defensive behavior that functions to blur the body form. I watched it bounce and became even more amazed as it began calmly walking away while continuing its vigorous bouncing – quite a spectacle! Cokendolpher, J. C. 1981. Revision of the genus Trachyrhinus Weed (Opiliones, Phalangioidea). Journal of Arachnology 9:1–18. This entry was posted in Arachnida, Opiliones and tagged arachnids, entomology, harvestmen, nature, Nebraska, predator avoidance, science, warning coloration. Bookmark the permalink. Great find, Ted. Opiliones are very difficult to photograph, with her long legs and nervous character. Thanks, Javier. I’ve started paying attention to other individuals since this one – you’ll see these in future posts. The super long-legged ones are extraordinarily difficult to get good, close macro shots of because they wave their extra-long 2nd pair of legs around like antennae – try to get the lens inside 10cm distance and they’re gone! I enjoy trying to photograph Opiiones, but it can be a bit difficult to get past the legs when trying to photograph the eye detail! Nice shot. Great shots! The descriptions of the defensive behaviour are wonderful too, I’ve never seen a harvestman do that before. Is it unique to certain species, I wonder? Thanks, Geek – I’d not seen that behavior before, either. My understanding is that only some species exhibit bouncing, while others feign death. Many years ago I saw an aggregation of harvestmen in Costa Rica all doing the hula. They were on the underside of a leaf and when I disturbed them they all began to sway in synchrony. I’ll be that was quite a sight! This guy doesn’t need a costume for Halloween! Great find! I think it’s very cool this one is new to Bug Guide. What is even more cool is that it was the first harvestman I ever photographed! Really fascinating pictures, and good work Ted. Hi, Joe – nice to hear from you! Awesome photos Ted! The composition is really good. Thanks, Nik. Nice analogy with ‘War of the Worlds’. 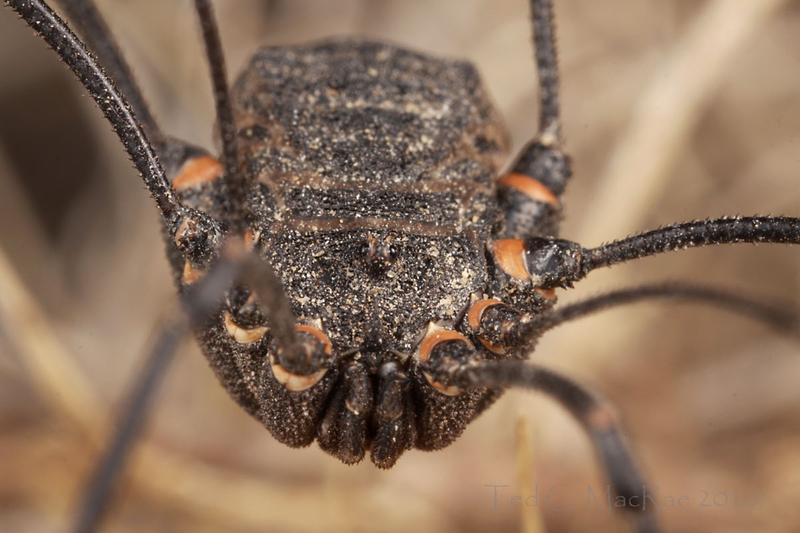 Harvestmen are one of those things that look fairly innocuous from afar (at least here in North America) but up close have an otherworldly freakishness about them. This is even more pronounced in some of the tropical/Old World species with their spines and tubercles!